In the past shiplap was used primarily in the construction of barns, sheds and other rural outbuildings, more recently shiplap walls have become a very popular alternative to more traditional forms of interior wood paneling. Shiplap paneling has a distinctive look that lends a rustic, homey vibe to living spaces and is now being used in a variety of DIY home applications. 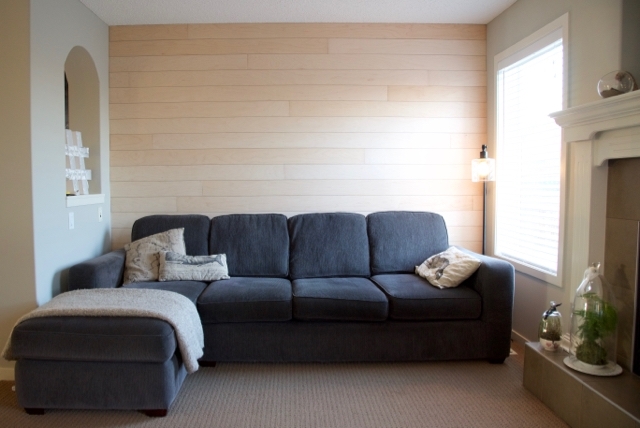 Shiplap walls can now commonly be found in bathrooms, living rooms, bedrooms, dens and family room renovation projects. Shiplap consists of boards onto which “rabbets” have been cut ( i.e. grooves along the edge or face of the wood that accommodate the overlap of the edge or tongue of another piece of wood). This creates a flush joint which forms a tight weatherproof seal. Shiplap is distinguished from the far better known “tongue and groove” form of construction by the fact that the rabbet is a surface groove on the wood rather than a groove cut into the edge of a piece of wood into which the tongue of the second piece is inserted. 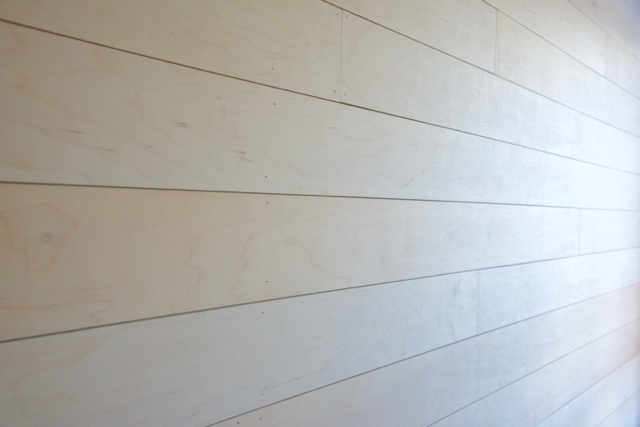 Shiplap walls are simpler, quicker and in terms of cost, cheaper than tongue and groove construction. For her raw materials, Lacey turned to her local Home Depot store, which stocked a variety of ply board paneling suitable for the project. Because she knew she would be either staining or applying a paint wash to the finished wall, she opted for a higher quality veneer plywood with a maple core. Those intending to do a multi-coat paint job on their shiplap walls can use lower quality veneer, although Lacey advises to choose plywood that is as smooth as possible for the best final effect. The good folks at Home Depot were able to cut her plywood into planks of the desired width and length utilizing their sheet cutting table which transforms the DIY cutting work of hours into a few quick passes finished in just a few minutes. Once home with her planks, Lacey did a quick sanding job on the individual pieces, and then set about installing the shiplap to the living room wall. Lacey advises starting at the ceiling, working down and across. Inevitably the last plank to be placed at baseboard level will need to be trimmed down to accommodate an odd amount of space left over, better to hide this kind of evidence below eye level and behind furniture placements. Important to the success of this project was careful preparation. 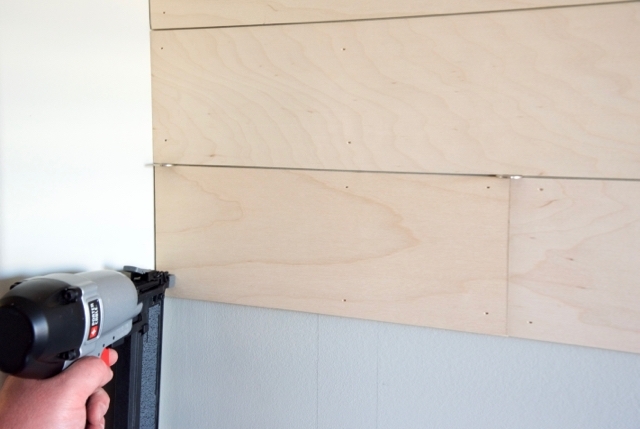 Lacey used an electronic stud finder to locate wall studs in advance of installing the shiplap planks. This is a vital step as each plank must be nailed into studs to make the wall treatment stable. She and her husband marked the outline of each stud in pencil as a visual aid, using a level to make sure the lines were straight, uniform and plum. Lacey and crew were not concerned about vertical plank seams; the space they needed to cover was wider than the 8 ft. planks cut from the plywood sheets, they simply cut smaller pieces to fit the additional spaces. Proceeding in this fashion they ended up with a very pleasing random pattern of plank end seams that further enhance the rustic look of the wall. To insure a uniform width of the horizontal plank seams, Lacey used a nickel coin inserted between each plank and her trusty level. 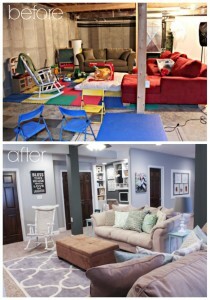 Be sure to check out her excellent guide which includes materials and tools list, info on how she accommodated electrical outlets, how she chose and mixed her paint wash and wonderful before and after, as well as in-process, photos.